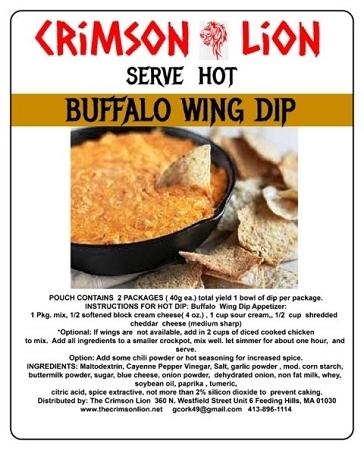 Buffalo Wing Dip This warm dip mix is great watching TV. Add in cream cheese, sour cream and Cheddar cheese for a warm dip. Add bacon bits or real bacon as desired. Dip on your wings and enjoy. Also as an option add cooked pieces of chicken in lieu of wings. not spicy but add in spice as desired. Each pouch contains two dip mix packets and makes enough for 1 bowl with each mix packet. Use a crock pot for warming the mix.